Have you ever suddenly become hyper-aware of a word then hear it everywhere? With me, it’s usually the word “like” (which I use far too much as an obnoxious substitute for “um"), but recently the word “exposed” has been hot on my radar. 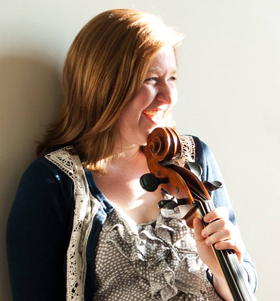 As presenters in the classical music world, we’ve all said it - we're going to expose someone to classical music. It’s a very convenient way to describe the process of discovery we hope all of our audiences will have. The thing is, most uses for the word “expose” are negative. It connotes nakedness, uncomfortable vulnerability, unfamiliarity, and bad behavior. 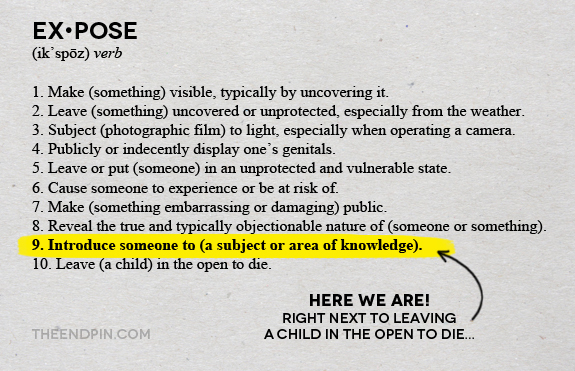 I know we’re all using “exposed" positively when we talk about music, and it’s true, exposing someone to some kind of knowledge is a completely valid and recognized use of the word. But when we look at the definitions of "expose," its positive meaning is buried among "unprotected," "indecently," or "objectionable." I think it’s safe to say most musicians don't want their audiences exposed in these ways. But unfortunately, the word is loaded with negative connotations and evokes justifiable feelings of resistance. Even in the best scenarios, the word feels like a chore or an obligation. Do you imagine being exposed to something to be delightful or just somehow necessary? The "eat your vegetables" mentality is partially caused because "exposure" indicates a total separateness between a person and the thing to which they are being exposed. Rather than uniting someone with their cultural birthright, exposing someone to music sounds foreign and uncomfortable. Another curious result of using the word “expose” when describing musical experiences is that it negates the active role of listeners. While it can sometimes seem passive, listening to music is an action - absorbing, synthesising, and attempting to understand. The best audience members are anything but passive! Being exposed to something is a passive act during which something is shown to you. Exposure is done to you, not with you. I propose our role is to share, to facilitate discovery, to reveal. So much more than near-synonyms, these are words that actually reflect the act of musicking that occurs between a performer and audience member. 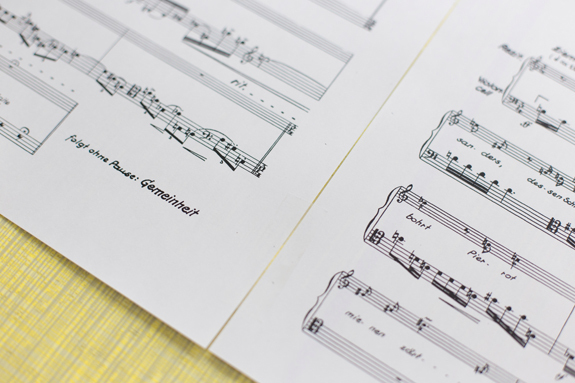 As musicians, we spend most of our time working in the realm where words end. But, when we're not performing, words matter. They shape so many of the ways we interact with and, as a result, interpret the world around us. We have a responsibility to choose our words with care. So how about it? 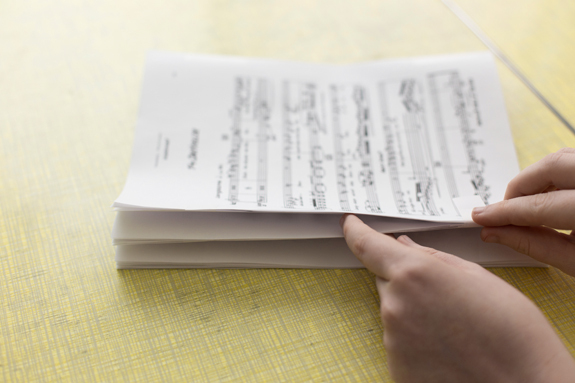 Let’s all take a look at our mission statements, grant applications, and concert proposals. Let’s check on the words we use when discussing audience development, outreach, program notes, and when speaking to audiences. 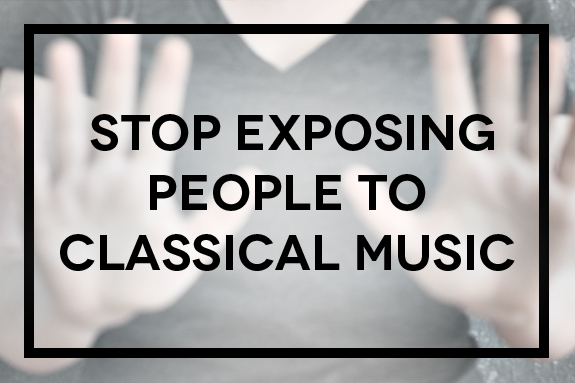 There’s no need to expose classical music to that word any more. These days 90% of my performance parts are PDFs printed on my home printer. 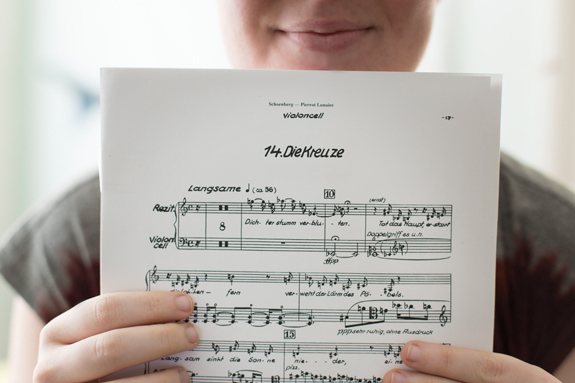 Unlike beautiful Urtext scores, these loose leafs are hardly stage-worthy. Over the years I've gotten very accustomed to binding these scores myself. My former teacher, Ronda Rider, calls it "New Music Arts and Crafts". Obviously, she is the best. Why tape your pages together? Loose leafs on stage are a risky proposition. 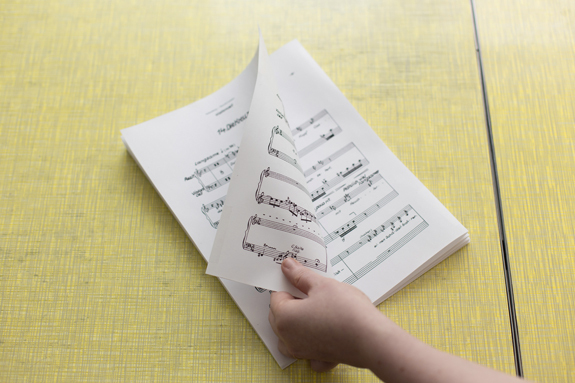 All it takes is one wrong page shift, a wobbly stand, or an over-zealous air conditioning unit and you're spilling sheet music all over the stage in a not-quite-performance-art kind of way. 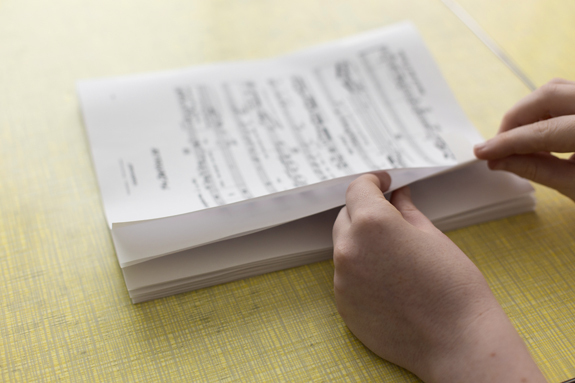 Some musicians manage to tape their pages together but don't bind them into a booklet. 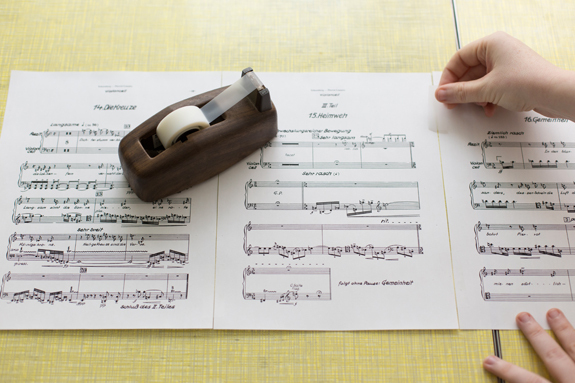 Have you ever seen the accordion-style spill of music off a stand? It's not pretty and there's no elegant way to recover on stage. 1. Tape all of your pages left/right sides together so the piece is one long row of pages. Leave a small gap between the pages as you tape them. Avoid putting tape where you might like to write notes in the future. Pencil doesn't stick well to tape. 2. 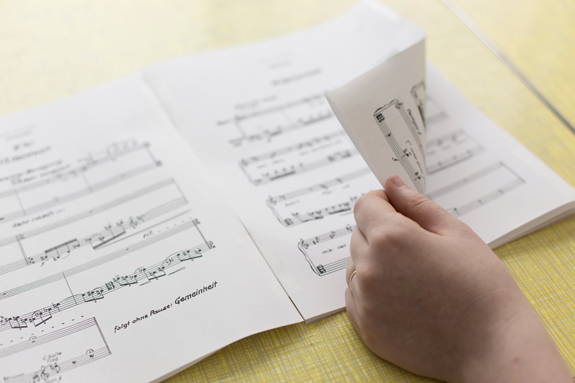 Fold your music accordion-style to create an unbound book. Now is the time to check your page turns. Did you get the pages in the right order? 3. 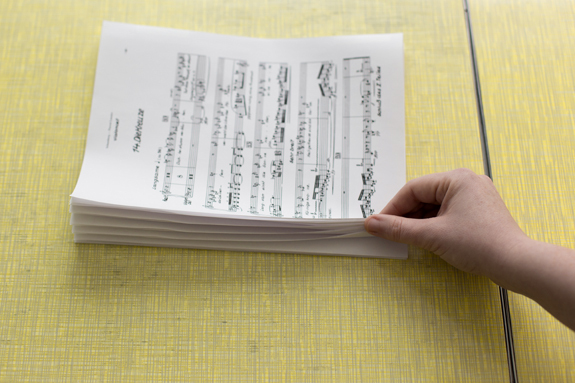 With the accordion of pages collapsed down to a stack of papers, turn the soon-to-be spine of your score towards you. 4. Gently separate a set of two page-pairs (the points where you already taped the pages together) and bind them together with a piece of tape perpendicular to the pages. 5. Continue to tape these pairs until there are none left. 6. Now tape the pairs into pairs. 7. Repeat until all of your pages are taped together. At first your music is going to be a little... voluminous... the tape needs time to get broken in. It's a good idea to tape your music as soon as you get it so you have plenty of time to get comfortable with the new set up. 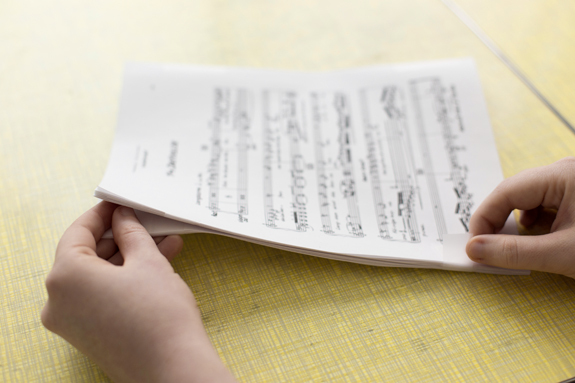 If the piece you're learning is very long (say more than 15 pages) it might be worth having it printed double sided on nice paper and bound professionally. 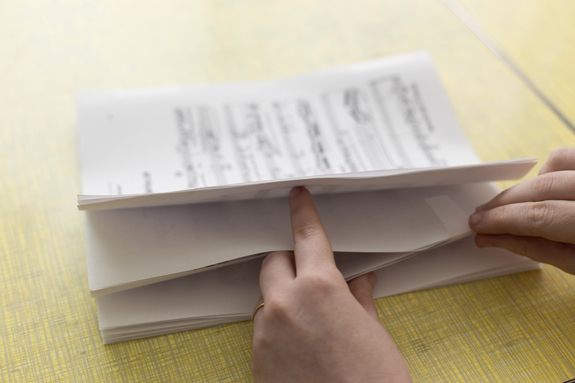 This Basic Method of binding scores doesn't work well if the score gets too think. There you have it, a basic plan of attack for binding your music. 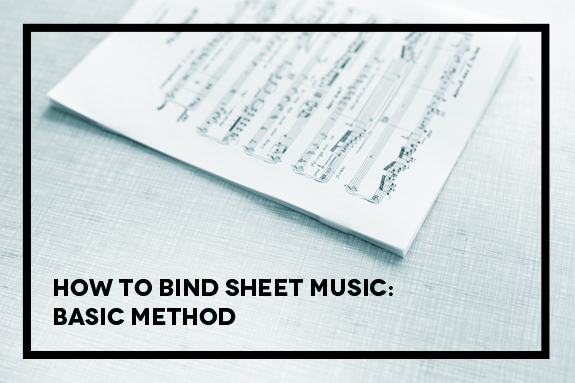 Of course, there are other fancy ways of binding that include third page fold-outs, blank pages for page turns, and tricks that begin to compete with pop-up-book artists, but in due time... mastering the basic method is an important first step.